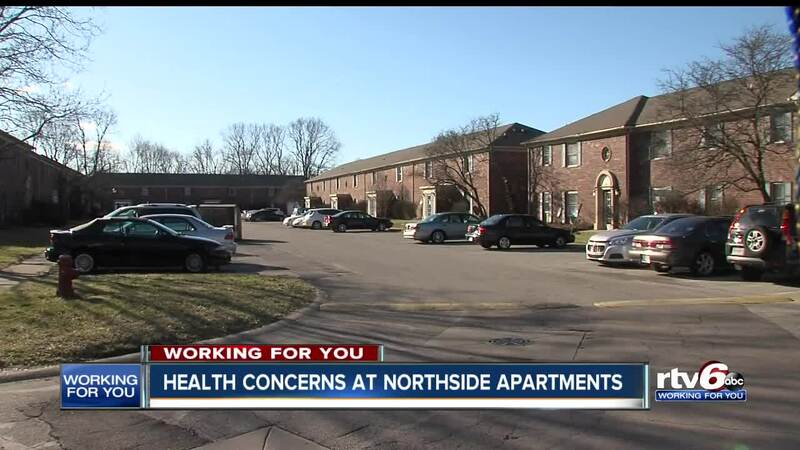 Health concerns at north side apartments. INDIANAPOLIS — More than 20 cases have been filed by the Marion County Public Health Department for problems at Lakeside Pointe at Nora, a north side apartment complex. Those cases mean that an investigator came to the apartment complex, documented the issues, told management about it, then came back and still nothing was done. "Not long into me moving here I noticed water tended to leak through the wall and come to roughly here," Will Corley, who moved into the Lakeside Point at Nora apartment in January, said. "They fixed it momentarily, but it came back mid-February." Corley said the problem received a temporary fix, but it took weeks for maintenance to come back when the leak started again. "This entire part of the floor was flooded, and it made it all the way to my door, to where literally I would have footprints," he said. "If it is left alone water mold mildew will start forming and that will cause issues for everyone in the building." One of the most common problems documented by the Marion County Health Department at the complex is mold - on ceilings, carpets, and walls. Corley said he hadn't called the health department out of concern for his neighbors. "If I called the health department and they shut down this complex you're gonna have over a hundred people that have nowhere to go," Corley said. RTV6 met another family living in the apartments dealing with their issue. The newsroom is protecting their identity. For two weeks they have had no heat. Their thermostat set to 70 degrees but the temperature inside is less than 60. "My mom has diabetes, and when she puts in her insulin or pokes herself, it gets cold, and her skin gets a little purple," a resident said. They use a couple of space heaters to stay warm. "We have three [heaters] but the other one when you turn it on - the whole electric gets powered off," they said. The family has cardboard against their sliding door to keep the cold out, and they said every time they call for a fix, they're promised the fix is coming. "We've been waiting for the door to be knocked, but nobody comes." The housing at Lakeside Pointe at Nora is affordable, but Corley said that's no excuse. "It may be cheaper, but at the same time they need to care about people's health and their well being instead of how much money they can bring in at the cheapest price," Corley said. RTV6 made several phone calls and stopped by the office but were told there's no manager available today. RTV6 will keep pressing for answers about what's being done to resolve all these issues. The Marion County Health Department is limited in its enforcement of these issues. When cases are referred to court, it's up to a judge to decide what happens. That could mean fines, or in the most extreme cases, they could force the apartments to be vacated.